Regulations require fisherman to return Bull trout in most locations unharmed so identification is important. Although the species was once abundant and widespread, bull trout now exist primarily in upper tributary streams and several lake and reservoir systems. The main populations remaining in the lower 48 states are in Montana, Idaho, Oregon and Washington with a small population in northern Nevada. Bull trout have been extirpated from California. Bull trout may live near areas where they were spawned or migrate from small streams to larger streams and rivers or from streams to lakes, reservoirs or salt water. Migration is critical to healthy populations. Bull trout numbers are declining because they are more sensitive to increased water temperatures, poor water quality and degraded stream habitat than many other salmonids. Further threats to bull trout include hybridization and competition with non-native brook trout, brown trout and lake trout, over fishing, poaching, and man-made structures that block migration. Bull Trout are listed as a threatened species in the State of Oregon. Bull trout are members of the salmon family known as char. Char are distributed farther north than any other group of freshwater fish except Alaskan Blackfish and are well adapted for life in very cold water. 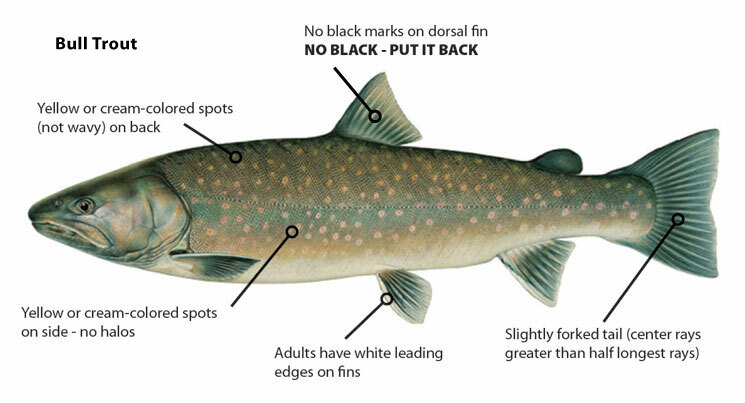 Bull trout, Dolly Varden and lake trout are species of char native to the northwest. They can grow to more than 20 pounds in lake environments. Since Bull trout need cold, clean water to survive, they are typically found in the headwaters of Oregon rivers. They are predatory fish, eating mostly insects as juveniles and other fish as adults. Spawning occurs in the autumn when water temperatures drop below 50F/10C . The Metolious River and the Metolious arm of Lake Billy Chinook are two of the rare places in Oregon where you can catch and keep Bull Trout. Bull trout fishing is good in the Metolius arm and fair in the Deschutes and Crooked arms. Harvest is limited to 1 bull trout over 24-inches under the daily trout limit. Note: Anglers can now keep 5 kokanee in addition to daily trout limit. No bag or size limits on brown trout. Anglers report fair fishing. Catch-and-release for trout including bull trout. Fishing is restricted to fly-fishing only upstream of Bridge 99 (Lower Bridge). Artificial flies and lures permitted below Bridge 99 (Lower Bridge). No bait allowed. What can be done long term to help ensure the survival of the Bull trout? A strong commitment by private citizens, industry, state, federal and tribal groups to change, reduce or eliminate activities that degrade streams and rivers will be necessary to truly recover many species of native fish. Much bull trout habitat in mainstream rivers and streams is privately owned, making conservation activities on private lands a key element to restoring aquatic habitat and recovering native fish populations. In some areas, reducing the potential for hybridization of bull trout with non-native fish species would enhance bull trout survival and recovery.